With Ebola blowing up in the headlines, WHO projecting 10K infections/week by December and an apparent 70% mortality rate, longtime reader JeepBoy was kind enough to send in some background and info. Hope this is helpful in answering questions you may have. I feel I really should post this due to all the half ­truths and outright falsehoods being spread on many websites about Ebola. I am NOT an expert but I am a reasonably knowledgeable individual on the subject. I have a BS as a Medical Technologist (this qualifies me to work in a hospital lab) and a BS in Microbiology. Not a Masters degree, not a PHD, just a Bachelor's of Science degree. I worked 8 years in hospital labs, then 19 years as a chemist with the state department of health. 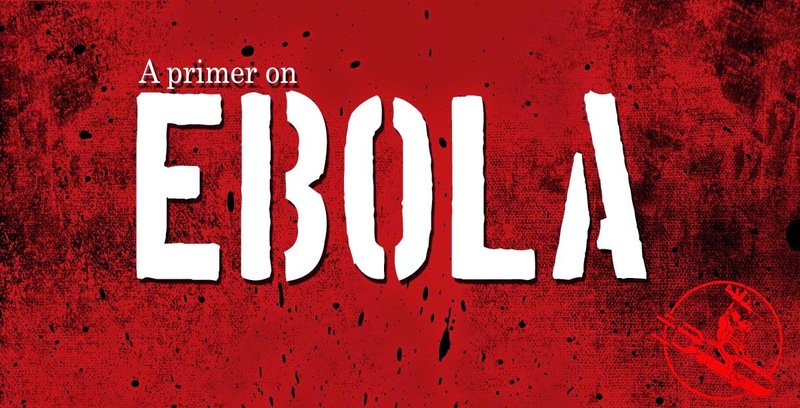 I followed the various Ebola outbreaks since back in the early 1980s. Ebola is a filo-virus, and is an odd duck even for viruses which are really strange at times. OK this is the c­a­t spells cat version of virology (I'm really just hitting the basics here). Viruses contain a strand of DNA or RNA that they "inject" into a cell after the virus particle invades the body. This strand of DNA or RNA uses the cell's own DNA repair mechanisms to "hijack" the cell and to reproduce more virus particles, consuming the cell's resources until the cell bursts (lyses) and releases the virus particles to continue the process. Many people misunderstand what is meant by airborne transmission of a disease causing organism. Medical lingo is like Lawyer lingo, words mean specific things. Airborne transmission means something like a person in office 7C gets "the flu" and three days later a person down the hall, around the corner in office 23F gets the same bug because it is spread throughout the building by the air conditioning system. This is different from a virus that is spread by body fluid contact. Body fluids can be spread a considerable distance by aerosol (coughing and sneezing) but this is a different medical term than airborne. Too many people are confusing airborne and aerosol, they are different. Ebola has several known strains, Reston, Marburg, Zaire, Sudan, and a few others I cannot remember off the top of my head. One strain, Ebola Reston IS known to be airborne transmission. This is the strain talked about in the book THE HOT ZONE that took place in Reston, VA in the primate research facility. This strain can infect people but it has NO harmful effects on people. You do not even know you have it. For some reason it is not a species jumper like the other strains. The other strains ARE species jumpers and do have harmful effects on people (massive understatement, what hemorrhagic fever does to the human body is truly horrible ). Fortunately, the strains that affect people are only spread by body fluid contact. These fluids can contain viable (infectious) particles for a considerable length of time, under perfect conditions for at least several days. Proper sanitation methods as practiced in the western world will do an excellent job of containing an outbreak, simply wiping down surfaces with disinfectant will get most if not all of the virus particles on surfaces. More on this later. The reason that Ebola gets to epidemic stages in sub-Saharan Africa is due to the near total lack of Western levels of sanitation and hospital care in these areas and the funeral practices in these countries. The family of the deceased cleans and prepares the body for burial. This almost always leads to the family being infected. Now to getting infected with Ebola and what it does to you. It does not take many virus particles to infect you, in theory only one is needed but usually more than that. A bit of information bandied about on the web is that 10 drops of body fluid contains enough Ebola to infect 10,000 people. True in theory but not in practice. One mililiter of Botulism toxin can in theory wipe out half of New York city but in reality.... you have to eat Botulism and getting that one mililiter broken down and spread in that much food to affect half of New York is a different story. It makes for great headlines but isn't really accurate. When you get infected with Ebola, the first thing that happens is the virus enters your cells and begins to reproduce by hijacking the cell processes. During this time, your body is beginning to produce more virus particles and at SOME point, you begin to shed virus particles in body fluids. You DO shed virus particles BEFORE you start to show the first symptoms. The CDC annoucements that say you are not infectious until you show symptoms are NOT ACCURATE and anyone who has taken a single virology class will know this. Why the CDC is spreading this deliberate falsehood I do not know. As the virus spreads to different parts of your body and the amount of virus builds up you begin to show symptoms, starting with fever, nausea, vomiting and diarrhea. Please note that these symptoms are not unique to Ebola, they are what you will often get with any number of mild diseases including food poisoning and most Influenza (the "flu") infections. Many people with weakened immune systems can die at this stage before reaching the distinct symptoms of Ebola. As the infection progresses, the virus invades more and more organs of the body and "takes them over" as I described earlier. This causes the organs to begin to fail as they LITERALLY begin to LIQUIFY as the cells burst releasing more virus particles. In some cases the bones even begin to liquify. This is the final stage of infection and many people die before getting to this stage but by this time you are leaking blood through your skin, vomiting blood and pretty much anything your body is excreting is full of virus particles. Another thing not discussed much recently: different strains of Ebola have different fatality rates. One of the strains has only a 50% fatality rate, half the people who get it survive. Some of the others have 85­%-90% fatality rates. We do not know why they are different. The same thing occurs in other viruses, the "Spanish flu" of 1918 killed mostly people in the 20­-40 year old range, while most influenza strains tend to kill the very young and the very old. Scientists have never been able to figure out why. Influenza by itself is rarely fatal, it kills by weakening the body and the body's immune system so you are more susceptible to bacterial or fungal infections. This is why when you go to the doctor with influenza (the"flu"), they send you home with antibiotics. Antibiotics have no effect on viruses such as influenza but do help your body fight off the bacterial or fungal infections that you can get while weakened by influenza. That is what the Dallas hospital did with "patient zero". Admittedly, the hospital really dropped the ball in this case but I can see how it happened (remember I worked 8 years in hospitals). Several mis­steps and errors had to stack up to get this blunder of sending the man home but this was the emergency room of a hospital and no one was really expecting a case of Ebola Hemorrhagic Fever to walk into the ER. The symptoms he was showing are not unique to Ebola and are really quite common to a lot of different illnesses. I'd like to add that, while the media is likely to continue to churn out the panic-driven headlines for the foreseeable future, there is not a need to freak out and quarantine yourself up. Keeping away from sick people, washing your hands regularly, avoiding touching your face/mouth are some sensible daily precautions. If the outbreak worsens stateside, expect to see a run on stuff like N95 masks, nitrile gloves, hand sanitizer and so on, similar to what happened during the swine flu outbreak back in '09. With Ebola being a lot scarier, expect the reaction to be amped up accordingly. I wouldn't be surprised to see some quarantining if the outbreak gets bad enough here in the U.S., or at least schools closed, employers telling their people to stay home and so on. If you're in an a 'hot zone', self-imposing a limited quarantine would be a smart move. If there's a possibility that folks in the general public are stricken with Ebola, avoiding contact with 'em would be a sure ticket to avoiding infection. Having basic necessities on hand to avoid a trip to the store for a week to a month (which we should all have anyways) would be a wise preparation for such an eventuality.